DETAILS Every year at Thanksgiving we pause to think about what we're thankful for. Gathered around the table, we all take a turn verbalizing our thanks. The children enjoy making it an "event", so we've come up with a variety of ways to do just that. For our thankful tree, I painted a trunk with branches on a large piece of brown wrapping paper (mine was 24 inches square). When our guests arrived we asked them to trace one of their hands on colored construction paper and cut it out. 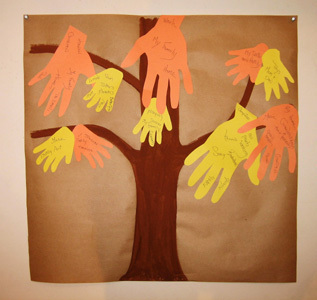 They then wrote their "thankfuls" on the hand with a variety of colored markers and glued it to the tree like leaves. The children were responsible for seeing everyone participated. When the tree was completed, we tacked it to a piece of foam core and placed it on the buffet in the dining room. During dessert each person talked about what they had written.